Sorry the tarpon and permit week as posted on last blog has gone. As I said these fish get under your skin, as a game fish they have the lot. Big 150lb + jump and run like you cant believe and hard to bring to the boat. I remember when I started fish for them years ago my guide said put it like this if you are the best tarpon angler in the world you will loose 4 out of 5 and he was right. But when you get your first 100lb + to the boat nothing is better. Seeing my old pal Jim Whippy holding on of Johns best fish brought back the memory of one of the biggest fish we have ever had on board. 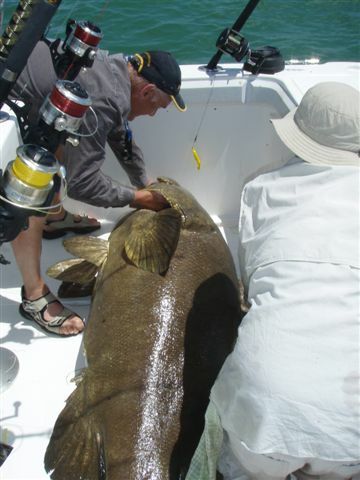 After many years we have perfected a method of getting big and this one was 400lb + Goliath grouper to the boat. It involves the Whippy walk and works as you can see. As a lot of people seem to want to catch a fish bigger than themselves this one fits the bill. Two facts on the Goliath one this is not big, they go to over 1000lb and this one was caught in less than 10 YES 10 ft of water. 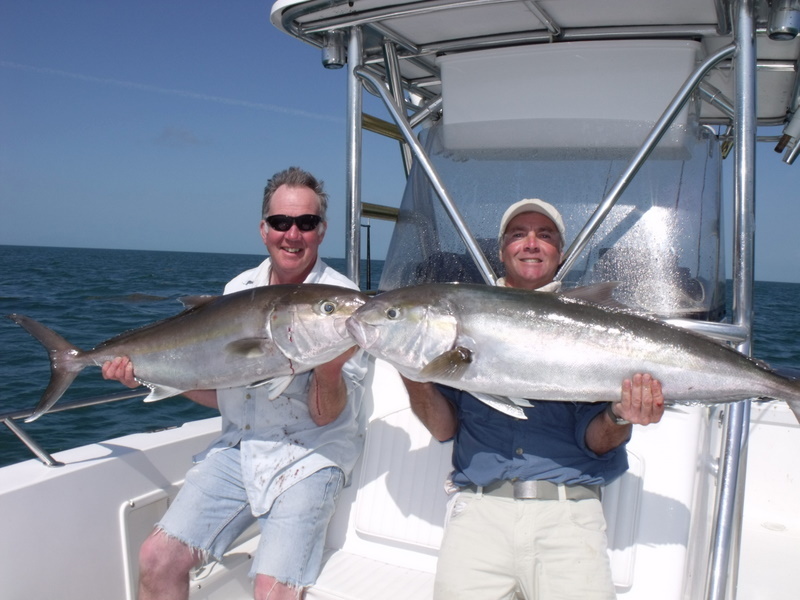 A fishing holiday in the Florida Keys can certainly make your dreams come true. Due to a late cancellation I have one week during prime Tarpon and big 40lb + Permit season. As we have taken a deposit for this week I can discount at least 25% on are normal prices. This is a one off as we are normally booked up well in advance as Tarpon seem to get under the skin. This time of the year 1000s yes 1000s of tarpon migrate through the Keys and in recent years they average over 150lb where we fish. Last year we had one very close to 200 and sett a new boat fight PB 2hrs 35 mins and this fish went in a straight line to Cuba and when we got it to the boat we were some 3.49 miles from the hook up. We start early in the morning using radar to run down in the dark and start 1 hr before daylight. To see a 150 jump at sunrise is just off the charts. As we start early the rest of the day can be spent fishing for anything else you want. Pemit are on the spawn on the deep wrecks and we have had fish to over 40lbs at this time of year. Dorado will be in full run offshore and will take anything you want also it is the time of year we get a run of big sailfish and we were lucky enough to have a white marlin a few years ago. Please email and I am sure i can work out a very special deal, dates are 13th April to 20th and up to four anglers. 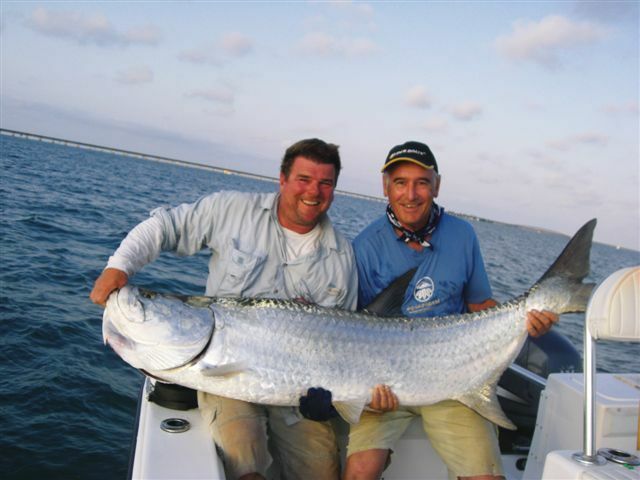 During this winter Florida Bay has had vast shoals of Spanish Mackerel and with the mackerel come the shark. One of my favorite shark is the Black tip these shark jump run and just don’t want to come in. They rarely go over 100lb so you can use light gear and have max fun. We use 30lb braid or 25lb mono, braid gives a jerky fight mono is a lot softer and when a jump lands on braid normally the fish is off. One day last week I took Carol and Paul to my top Black tip mark and it did not disappoint. The mackerel arrived in minutes and the shark were not far behind. 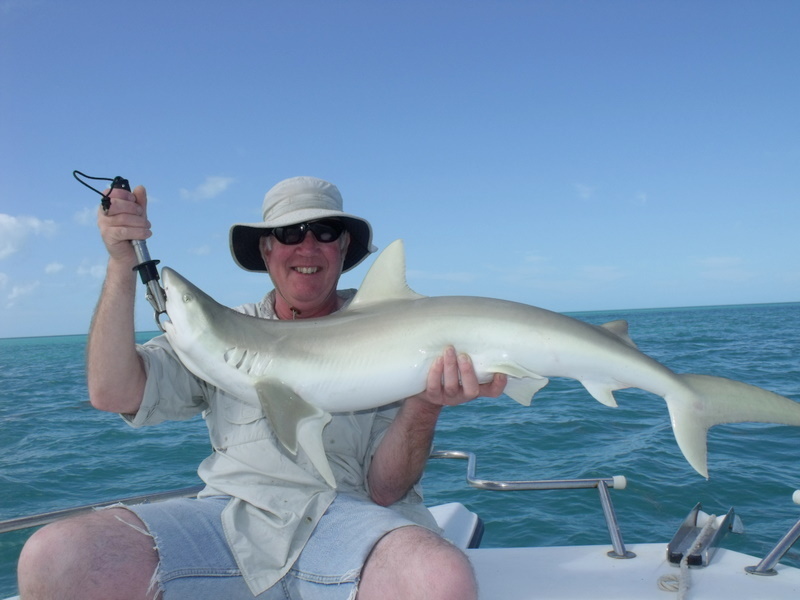 Carol started off with a lemon shark just short off 200lb then a stunning black tip. I was shown many years ago how to get these aboard, it does seem to amaze guests when I ask if they would like it aboard for a photo. 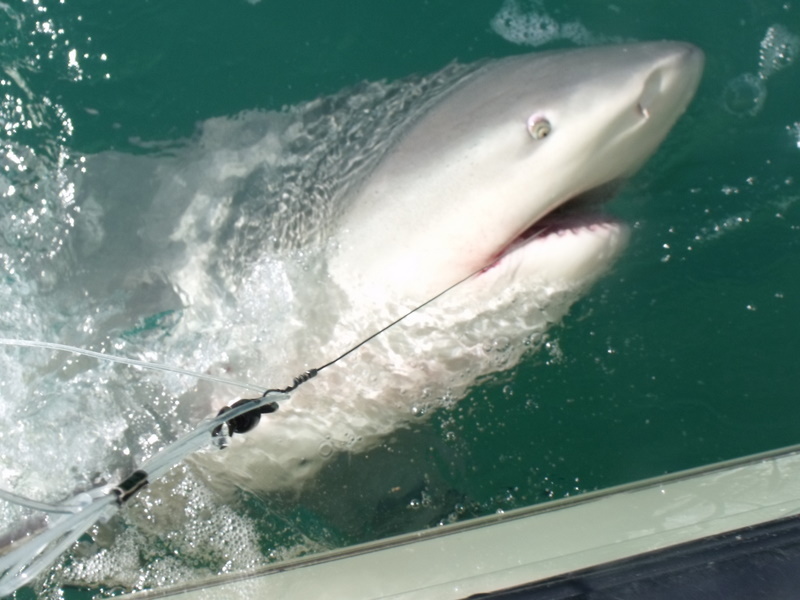 So with the huge Bull shark, Lemon shark and now the Black tip Carol did what we call a mini shark slam well done. 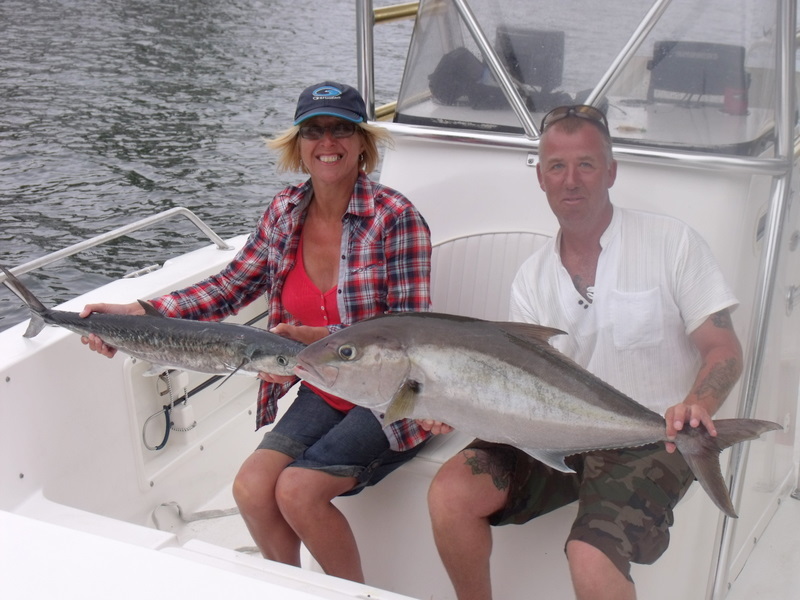 Carol and Paul also had a boat PB when they boated 21 shark for the day the best I have had for two people. Back to the blacktip some people like to eat them as well, I have tried one but in my view there are a lot better fish in the sea so they all go back. The other thing I like about shark fishing is seeing small hooks and jigs in the fish. These soon rust out but they must make fantastic fish stories. I can just imagine ” it was so big I could not stop it ” what do they say elephants eat peanuts. One day last week we woke up to flat clam seas so with are normal what to do breakfast meet offshore was the call. As I have said before our boat is just as happy 30 miles offshore or in 12in deep on the fl;ats. Also 4 to 6 ft seas are no problem but most guests prefer clam seas for offshore. Rigged for dorado, sails and maybe tuna we went south, soon we were some 18 miles south of marathon and in some 6 to 7 hundred feet deep. Ideal conditions for a basic 4 or 5 bait trolling only one problem in all ares where there should have been fish Portuguese Man of War not nice see next blog. So a change of plans and with the wind getting up as well back to some deeper wrecks in 200ft which are on fire with big amberjack. On arriving at one of our wrecks the seas were getting big but a few drifts before we went inshore. First drift bang Carol was on but this one did not want to come up and after she did so well we lost the fish. Shortly after Paul was on and after a good fight the fish was in the boat. 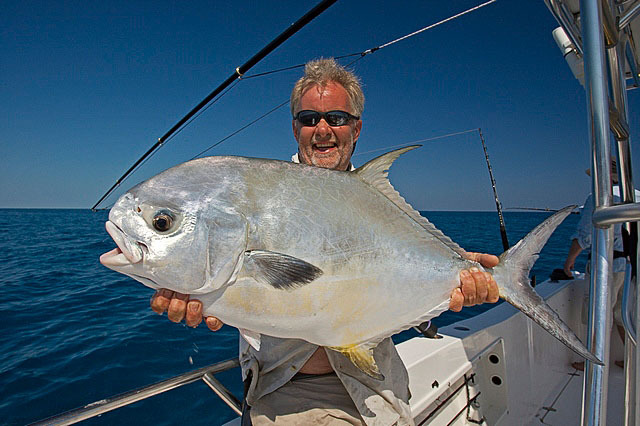 Not an AJ but a very large almaco jack, this is only our second almaco and at 27lb a very large one for the Keys and I think it will be a long time before we catch a bigger one. 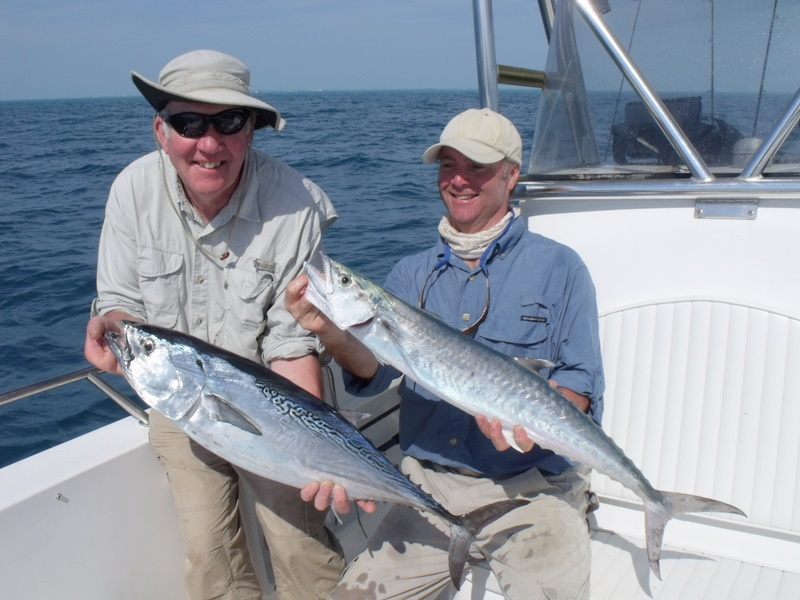 The seas were not getting any better so a run inshore to have fun with the king mackerel. These are also on fire at this time of year so we put the pick down on the edge of the reef and started to chum and chunk feed. Very shortly it was macerel on and with a good size fish to 18lb. Its hard to tell you how hard these fish hit the baits but most anglers come back with hugh smiles after a mac attack. One trip last week I took Carol and Paul to an area in Florida bay know as the bomb holes. During the second world war a long runway was built at Marathon and many bomber crews were trained here. The crews would fly out to the middle of the bay drop one bomb then as it is less then 10ft deep use the first as the target. Some of these sites have still not full recovered and make top fishing marks with patches of clear ground and drop offs. While Carol was having fun with the mackerel and blue fish Paul decide to sit it out with a live bait. Then unhappy live bait then bang a grouper on and the first job to stop it getting back to its hole. Well Paul had this one beat and a fine red grouper to the boat. Now I love eating fish and red grouper is top table fare large creamy white flakes but this fish was slipped back in. Why well we are in an other grouper ban. Last year it was decided that the gag grouper was declining in certain areas. So the best course was a total grouper ban during the spawn. This will last till may and to make it easy to police its all grouper in all the areas of concern. Brain dead law they call it fish for them if you want but they all go back till may when size limits and bag limits come in force. Its so nice to be in a fishery with fast and active control. If it needs help do it before it becomes a problem and I had a good feed of mackerel thanks to Carol. Still after running the fishing holidays for over 7 years I smile when a guest gets a big and I mean big fish. The other day was no exception, Carol and Paul are on their second trip but decided to come on there own to have total control, no problem. My local diver friends gave me a mark that they free dive in 20ft. It is one of the largest coral heads in Hawks channel come up from 40ft to 20ft. 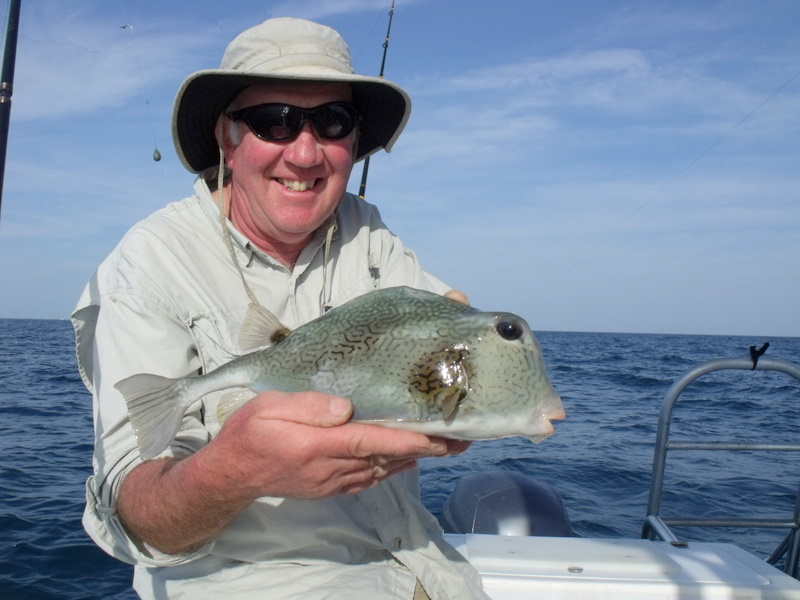 It is a good fishing mark and a top spot for blue runner live baits for big macks and sails. The other day it was a bit quiet so as I often do down went a big bait. The men in grey coats [ shark ] can often do this. In seconds I mean seconds float under and all hell broke out. While Carol is strong and a good angler i had to hold on otherwise it was going to be over the side for her. Then a long and dogged fight no long runs but this fish did not want to come up even though it was only 20ft no sight of fish. The fight was more like a Goliath grouper and this is where John lost a big one last summer. Then a bit of colour and then the O MY GOD we need a bigger boat. Well in 12+ years I have seen some big bull shark but this was maybe the biggest. Based on lenght my estimate was 400lb + a monster and a lady angler with a bit of help and double teaming. Just goes to show in the Florida Keys there are some truly huge fish everywhere. Back to blog title this is a DIVE SPOT for the locals, who always tell me you can tell when a shark is not happy by the fins. 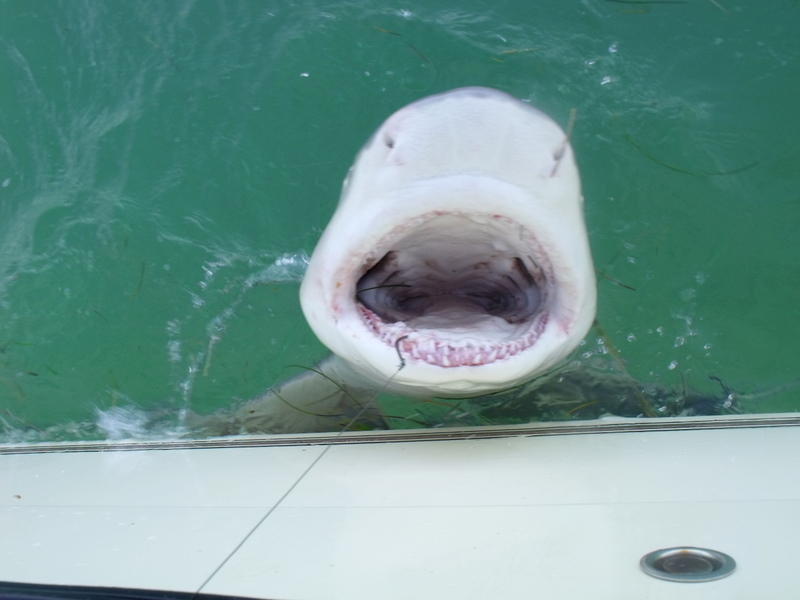 Well this shark was not happy and as to diving here NO WAY!!!!!!!!!!!! Comments Off on Dive spot ????????? Last week on one of our exploring days found a new flat. A long way from home but the more miles from the mainland the less fishing pressure. Perfect flat just big enough the right amount of grass and open areas rock and roll. Water temp to low after a couple of cold windy nights the sea temp was down to 68 to cold for bonefish who drop off into warmer deeper water. However one of my pet sayings is you can only catch whats there and after a few casts with shrimp we found good keeper size trout. 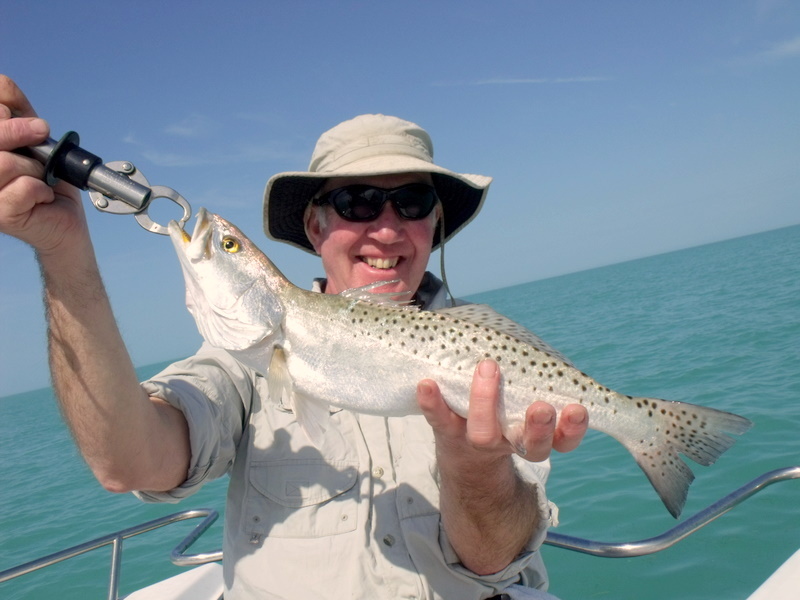 The spotted seatrout is a scrappy free taking fish and is top table fare and does not mind cold water. It is also a prime example of Florida fish management. It has closed seasons for spawning which differ state wide and a slot size limit. You can only take fish between 15 in and 20 in but you can keep one over 20 in in a total bag of 4 per person per day. Makes sense and after years of checking fish numbers seems to work. 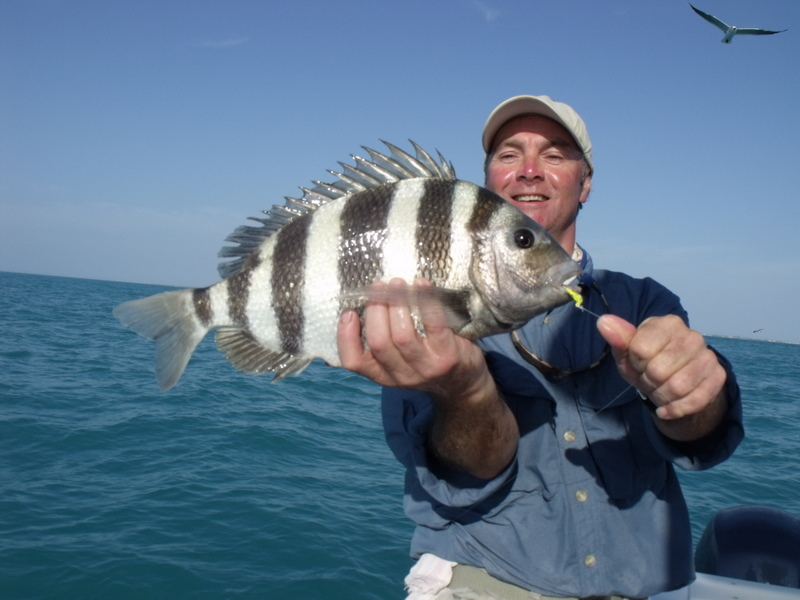 Talking of table fare I do love eating fish and Brian caught a top eating fish the other day a sheepshead. This fish has a nearly exclusive diet of shellfish which gives it one of the best food values here. Brian who has been coming on fishing holidays here for many years is still blow away catching different species evey time he comes. 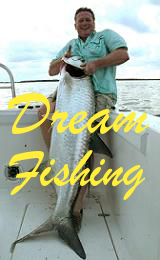 We at Fish the Dream are now over 100 species and the base record is 55 different ones in just 6 days fishing. Back to the day on the new flat after we had enough trout and saying we will be back for the bones and permit we noticed feeding birds not far away. Feeding birds in the Florida Keys always means fish and these were no excepetion. First cast bang a reef shark, not big at 20lb but on light tackle they pull your string big time. Once they are in a feeding mood like this they will take anything. To see a shark hunt down a top water lure just amazing. Yesterday a lady angler nailed a shark a lot bigger than herself and I mean a LOT bigger next post. 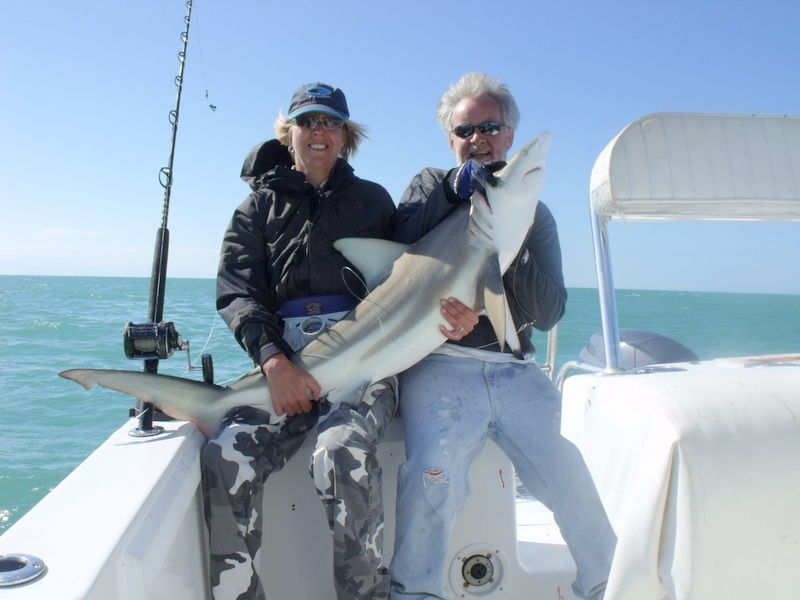 Filed under Fishing Holidays Florida Keys, Shark. As I said in the last blog its good when a plan comes together and we did it again. We are lucky at Fish the Dream to have a boat that can do it all as they say. This week the boat has been on flats less than 2 feet, edge of the reef in 90ft and we were going deep into the Atlantic wrecking. Mother nature had other ideas but a new wreck in 220ft and despite 15+ mph winds the call was just true strong. Nearing the wreck the seas were 4ft to 6ft and the odd 7ft we had a talk but still decided to keep going. The local word had been big amberjack so no light gear here. 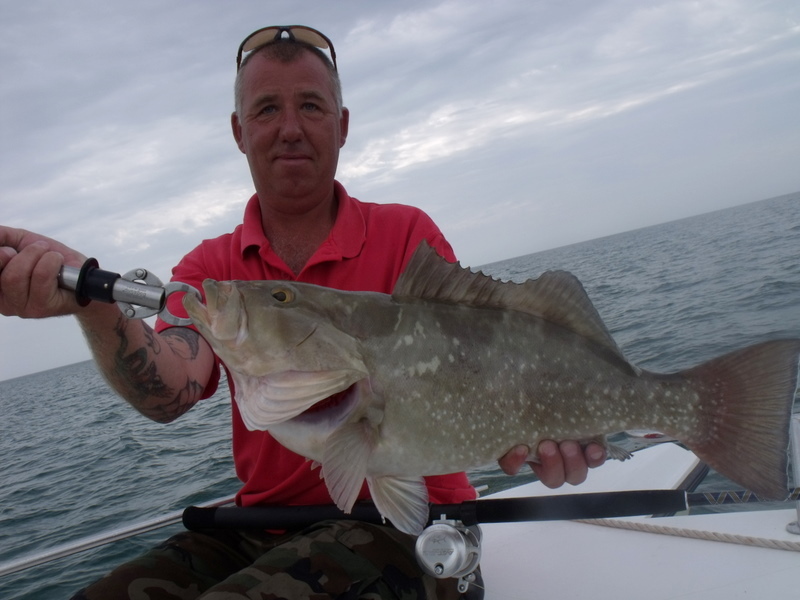 80lb rods and 80lb braid drags sett heavy 50lb is not uncommon, these fish have the local nickname wreck donkeys. On arriving at our new numbers it was changeling to save the least our boat has deep gunnels and we needed them here. The wreck was showing lots of fish but ones never knows what they are or if they are going to feed. The first drift and we were doing 2.5 mph in the wind a few taps for Martin then bang! Rod well bent and the reef donkey did not want to come up. Some time and nearly half a mile later the fish was in the boat, a prime 30lb amberjack so now one for Brian. Next few drifts hard to get it right in the worsening seas so one last drift. Two little taps then two fish on, Martins was fighting a lot harder than his 30lb one. Lots of grunts and groans, Brians fish in the boat, nice 28lb but Martins was having none of it. Then nearing the boat the hook pulled proving why they call it fishing not catching. The weather was not getting any better so we decided to get into more freindly water and as Arny said “we will be back”. It was a long hard choice on which boat to get to give the complete Florida Keys fishing holiday experience and after ruuning holidays for over 7 years I still think i made the right one. While this week we did not do any offshore trolling or kite fishing it was more about new marks but with our boat we can. The radar is the only way to do long hard runs at night and wakeing to a tropical sunrise 30 miles offshore on the tuna grounds amazing. As Hannibal said in the TV show i love it when a plan comes together and we had one that did. We are having a low key week and trying out some new spots and methords. Despite fishing here for over 12 years still finding new marks and methords the fun of the Florida Keys. This deep water mark was given to me by a diver better than any fish finder. Still amazes me these guy free dive to over 100ft then spear fish not for me. Back to the mark he was diving for grouper and snapper in an area of steep drop offs and ledges, when he noticed lots of king mackerel. Back on the surface he took the numbers and passed them on. We dropped the pick well up-tide and started chumming and dripping oil. Also a new method of chunking. Chunking is a top way to get all fish to the boat dropping small pieces of fish into the tide but it must be little and often. I thought maybe if we froze a 2 gallon block of pieces in water as they defrosted they would drop at a good rate. Well they did just right no mess and no shouting keep the chunks going. We had a live bait at about 20ft and a suspended bait at about 60ft then the wait. The first two takes took us by surprise both rods going at the same time. Long hard runs not many fish run as hard as kings one lost mid fight but one back to the boat. The next ones we were a bit more ready for, one in the boat any the other one a nice tuna. Chunking is very good for tuna cant wait to try out our new method on the tuna grounds. Back out today to a new deep water wreck 260ft should be some big amberjacks and maybe some mutton snapper. A strange one this. While exploring yesterday Martin landed boxfish. There are several familiar species, all wear their skeletons on the outside [ covered by skin ]. The tail and fins coming out side like a tortoise. Martin caught one on holiday with me in the Bahamas a few years ago and we tried it as table fare as the locals said it was the chicken of the sea. Not all of us agreed so this one was released, after biting me skips perks. Back to this weeks exploring all going very well new marks and new methods, all on next blog.